The Perfect Game Collegiate Baseball League’s Amsterdam Mohawks continue to rise in the national summer collegiate baseball rankings. The fifth “Summer Top 30” poll of the 2012 season has been released by Perfect Game and the Mohawks have moved up number three in the country. Amsterdam was ranked fourth last week. The Mohawks trail only the New England Collegiate Baseball League’s Newport Gulls (#1) and Keene Swamp Bats (#2). Over the last month, the Mohawks have risen in the polls from the low teens into the top three. The Mohawk Valley DiamondDawgs, currently second in the PGCBL standings, are among many teams listed in the “Others receiving consideration” category. According to the Perfect Game poll press release, teams are ranked on won-loss record, league dominance, depth and quality of professional-level talent and the overall strength of the league. All of the teams ranked in the top 30 and those under consideration have at least a .500 winning percentage. To see the press released and the full rankings, compiled by PG’s Allan Simpson, click here. With two weeks remaining in the regular season, the Amsterdam Mohawks continue to lead the Perfect Game Collegiate Baseball League with a .27-8 (.771) record. Amsterdam has a 6.5-game lead over second-place Mohawk Valley with 12 regular season games remaining. Over nearly four full seasons, Amsterdam skipper Keith Griffin has led the Mohawks to a 114-52 (.687) record. Fifty-seven of those 114 victories have come in the PGCBL. Amsterdam is three victories away from securing a second-straight season with at least 30 victories. The Mohawks’ current .771 winning percentage is the third-highest among teams ranked in the top 10 nationally. The national top 10 is composed of teams from seven leagues including the PGCBL, Cape Cod Baseball League, New England Collegiate Baseball League, Northwoods League, Coastal Plain League, California Collegiate League and West Coast Collegiate League. Amsterdam’s 27 victories are also the third-most among teams in the top 10. Both teams with more victories have played in more games. Amsterdam has been the lone PGCBL team to be ranked in the Top 30 this season. Over the last month, the Mohawks have moved up at least one spot in the national poll and have broken their own league record in three consecutive weeks. The Mohawks lead the nine-team Perfect Game Collegiate Baseball League in team batting average (.303) and team earned run average (3.34). Offensively, Amsterdam is first in the league in batting average, runs scored (260), hits (385) and doubles. Fourth Mohawks are among the top 10 in the league in batting average. Zak Colby (Faulkner), a former PGCBL Co-Player of the Week, is the current batting leader with a .411 batting average and a .489 on-base percentage through 33 games. Colby is also among the league’s top five in slugging percentage (.580), hits (47) and doubles (16). He has posted two five-hit games this season and recently reached base five times on two hits and three walks in a game at Glens Falls. Colby added a walk-off double to his resume on Tuesday night in a 4-3 victory over second-place Mohawk Valley in 10 innings. Jeff Boehm (Kentucky, .376), Ed Charlton (NJIT, .366) and Chase Green (SIU Edwardsville, .338) also have batting averages in the top 10. Ed Charlton leads the league in slugging percentage (.624) and his current 19-game hitting streak is one of the longest hitting streaks in Mohawks’ history. Charlton is also tied for second in the league in home runs. Outfielder Evan Stephens (Wake Forest) leads the Mohawks in batting average (.440) however he is just a few plate appearances short of qualifying for the batting championship race. Stephens has smacked 37 hits in 25 games and scored 29 runs. The Lexington, Ky., native also leads the Mohawks with 15 stolen bases. Amsterdam pitchers have allowed the fewest overall runs this season (145). The Mohawks have the most strikeouts (330) of any league pitching staff. Only one other pitching staff, Mohawk Valley, has recorded over 300 strikeouts this season. Starting pitchers Chandler Shepherd (Kentucky), Rocky McCord (Auburn), Mark Leiter Jr. (NJIT) and Matt Pirro (Wake Forest) continue to pace the nationally-ranked Mohawks. The foursome has a combined record of 15-0. Both McCord and Shepherd are among the league leaders in ERA. McCord, a 39th-round pick of the Minnesota Twins in 2011, leads the team in earned run average (1.34) and strikeouts (39). He is 4-0 in seven appearances. Shepherd, a 41st-round pick of the Chicago White Sox in 2011, is tied for the league lead in victories (five). He allowed just one earned run in his first 34.0 innings of the summer. The rising sophomore from Kentucky is 5-0 with a 1.35 earned run average. He has struck out 36 and walked five in 40.0 innings. Leiter, the 2011 PGCBL strikeout champion, is one strikeout away from reaching 100 in his two-year Mohawks career. Leiter has fanned 25 batters through three starts this summer and he is 2-0 with a 1.50 earned run average. The son of former Major League pitcher Mark Leiter paced the PGCBL last summer with 74 strikeouts. The rising senior from NJIT has struck out at least nine batters in two of his three starts this summer. Pirro has made five starts and six overall appearances for the Mohawks. He is 4-0 with a 2.70 earned run average. He has 20 strikeouts in 23.1 innings. Closer Chase Williamson (Auburn) is tied for the league lead with six saves. Williamson has pitched in 16 games for the Mohawks and has gone 1-1 with a 3.38 earned run average. The two-way player also clubbed a game-tying grand slam in the bottom of the ninth inning earlier this season against the Cooperstown Hawkeyes. 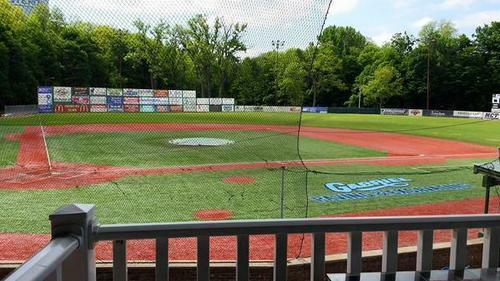 Earlier this week, 11 Mohawks were selected to play in the 2012 PGCBL All-Star Game which will take place on Tuesday, July 24, at Shuttleworth Park in Amsterdam. All 11 Mohawks will play for Team Griffin which will be led by Amsterdam head coach Keith Griffin. Mohawk Valley is the fourth PGCBL team aside from Amsterdam to receive consideration for the Summer Top 30 poll. Other league teams that have received consideration include the defending league champion Newark Pilots, Glens Falls Golden Eagles and Oneonta Outlaws. The DiamondDawgs recently ran off a league and franchise record 11-game winning streak. Mohawk Valley moved from sixth place to second place in the league standings. Head coach Roberto Vaz, a former All-American from the University of Alabama, has guided the DiamondDawgs to 21 overall victories, three shy of a franchise record set in 2006. The Dawgs lead the league in home runs (25) and extra-base hits (119). Slugger Eric Helmrich (Marist) is first in the PGCBL with seven home runs, Chris Cruz (Cornell) and Jack Morrow (Young Harris) are also among the top five home run hitters in the league. Chris Cruz is the reigning PGCBL Player of the Week. He batted .441 (15-for-34) last week in eight Mohawk Valley wins with three home runs and 13 RBI. Mohawk Valley’s 3.60 team earned run average is second to just league-leading Amsterdam. MV starters John Means (Fort Scott C.C.) and Joe Michaud (Bryant) are first and second in the league in earned run average. Means, a 2011 46th-round pick of the Atlanta Braves, leads the loop with a 0.97 ERA. He is 3-2 in seven appearances with 46 strikeouts in 37.0 innings. Michaud is 5-1 with a 1.29 earned run average and 48 strikeouts in 35.0 innings. Earlier this season, Michaud set a league record with 15 strikeouts in a single game. Both Means and Michaud are among the top five in the PGCBL in strikeouts. Starting pitcher Jesse Buratt (Baton Rouge C.C.) also made PGCBL and team history on July 11 when he threw the first-ever PGCBL no-hitter against the Albany Dutchmen. Seven DiamondDawgs have been selected to play in the PGCBL All-Star Game.